Dundee United have signed striker Mario Bilate on a two-year deal, subject to international clearance. The 23-year-old Russian-born Dutch citizen arrives from Sparta Rotterdam after three seasons at Het Kasteel. "He will bring a different dimension to our attack," manager Jackie McNamara told the club website. "He is strong, tall and quick and is at the right age to progress his career. Mario knows the players are developing here and wants to be part of that." United, who finished fourth in the Scottish Premiership last season, have sold Ryan Gauld to Sporting Lisbon this summer and lost defender Gavin Gunning under freedom of contract. Bilate joins new defensive recruits Jaroslaw Fojut and Callum Morris, while Scottish youngsters Charlie Telfer and Blair Spittal have also arrived to bolster McNamara's playing pool. 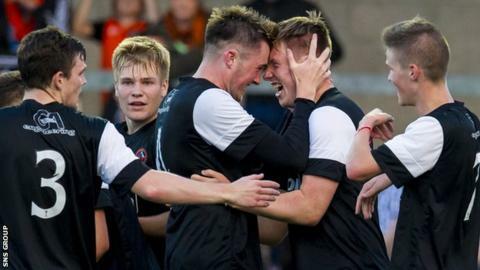 "We want the club to grow continually and with this signing we have enhanced our squad and improved our striking options," added the Tannadice manager.